Start with your arm hanging away from your side with your elbow straight and palm facing forward. Next, bend your wrist back as you side bend your head towards the target arm as shown. Next, bend your wrist forward as you side bend your head away from the target arm. Your other hand keeps the shoulder depressed. Start with your arm up and out to the side with a straight elbow as shown. Your palm should be facing upwards. Next, bend your wrist upwards as you side bend your head away from the target arm as shown. Then, bend your wrist downward as you side bend your head towards the target arm. Start with your arm hanging down at your side with your elbows straight and palm facing back. Next, bend your wrist back as you side bend your head towards the target arm as shown. Next, bend your wrist forward as you side bend your head away from the target arm. Your other hand keeps the shoulder depressed. Start with your arm up and out to the side with a bent elbow as shown. Your palm should be facing out to the side. Next, bend your wrist away and towards you as shown. ​Your other hand keeps the shoulder depressed. While sitting, rest your forearm on a table and lean forward until a stretch is felt. Gently swing your arm in circles. Your injured arm should be fully relaxed. Lean your trunk forward towards the floor to increase the stretch. Lying on your back and holding a broomstick, palm face up the injured side and palm face down on the uninjured, push the wand to the side and let your injured shoulder roll outward. Sitting in a chair, rest your injured arm on a table and gently slide it forward and then back. While lying on your back with your arm at your side, grasp your affected arm and slowly raise it up upwards and towards overhead. Your affected arm should be relaxed and your other arm performing the work. Using door pulleys and facing away from the door, slowly pull down with your unaffected arm so that your affected arm raises forward and up without effort. Your affected arm should be relaxed. The unaffected arm does the work. In standing, hold a broomstick with both arms, (palms up). Raise up the broomstick allowing your unaffected arm to provide most of the effort. While holding a broomstick (palm facing up on the injured side and palm face down on the uninjured side), slowly raise up your injured arm to the side. Grasp your elbow and gently pull it across the front of your body. Place your affected hand on the wall with the palm facing the wall. Next, walk your fingers up the wall; then slide your hand back down the wall to the starting position. 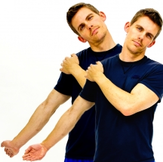 With your affected elbow bent and shoulder raised, use your other hand and gently push your affected elbow back over your head until a stretch is felt. Start by lying on your side with the affected arm on the bottom.Your affected arm should be bent at the elbow and forearm pointed upwards towards the ceiling as shown.Next, use your unaffected arm to gently draw your affected forearm towards the table or bed. Place your elbow on the edge of a table and use your other hand to press it into a more straightened position. Grasp your wrist as shown and gently turn your affected wrist towards palm face up. Keep your elbow bent and by the side of your body. For extra stretch you can use a wooden spoon held on the affected side. Bend your wrist up / down as shown, keeping your forearm rested flat on your thigh. Place your elbow on a table and use your other hand to bend it into a more bent position. Grasp your wrist as shown and gently turn your affected wrist towards palm face down. Keep your elbow bent and by the side of your body. For extra stretch you can use a wooden spoon held on the affected side. Bend your wrist upward / downward with your thumb facing up. Use your unaffected hand to bend the affected wrist down as shown. Keep the elbow straight on the affected side the entire time. Place your hands on a table with elbows in a straightened position. Next, lean some of your body weight into your arms and gently rock forward and back. 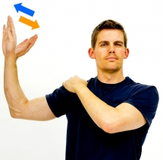 Place the palms of your hands together to stretch the wrist as shown. Place the back of your hands together to stretch the wrist as shown. Use your unaffected hand to bend the affected wrist up as shown. Keep the elbow straight on the affected side the entire time.